Located three miles north of Fort Bragg, MacKerricher State Park (www.parks.ca.gov/?page_id=436) occupies a prime piece of California real estate. The habitat and scenery are diverse, and you just can’t beat the beach, bluff and headland views of the dramatic Pacific Ocean. And although the landscape is nothing short of magnificent, the wildlife viewing is second-to-none. Between the year-round antics of the resident Harbor Seals, and the seasonal Gray Whale migration, there’s something for just about everyone. And the good news is, with several wheelchair-accessible viewing areas in the park, nobody has to miss out on the fun. 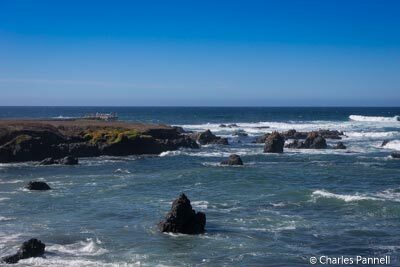 The other good news about MacKerricher State Park is that’s there’s no day use fee, so you can enjoy the facilities for free. The visitor center is open seasonally, but it’s worth a stop even if it’s closed, as there are several whale skeletons on display nearby. There’s accessible parking near the entrance kiosk, and level access over to the outdoor exhibit. 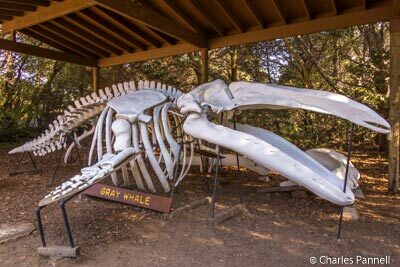 The Gray Whale and Humpback Whale skeletons are located on a level grassy area, with adequate pathway access around the bones. There are also a few interpretive plaques that offer a good primer on whale anatomy and behavior. The Gray Whale migration takes place from December through April, and it entails an arduous journey from the Bering Sea to Baja California, and back. The southbound leg begins as ice forms in the arctic, and by the end of December migrating whales are easily spotted along the Northern California coast. The return journey begins in February or March, but since the migration takes place in waves, whale sightings are possible at any time. It’s also worth noting that since the females give birth in the warm southern waters, juvenile sightings are more likely on the return leg. The best place to catch a glimpse of the migrating Gray Whales is at Laguna Point, which is a short drive from the entrance kiosk. Accessible parking and restrooms are located near the barrier-free .6-mile Laguna Point boardwalk. The loop boardwalk is wide and level, and leads through a small forest and out to an accessible viewing platform on the coast. Not only is this viewpoint an excellent whale watching site, but it also offers an equally scenic ocean view. And if you happen to visit on a off day for whale sightings, don’t fret, as you’ll still catch an eyeful from the resident Harbor Seals that lounge on the rocks. The seal colony is present throughout the year, but it grows during pupping season, from March to June. Don’t forget to bring your binoculars, for a close-up look at the females with their calves; and if you time it just right, you might also witness a birth. Pack along a picnic lunch to enjoy in the nearby picnic area. Standard picnic tables are located on a level grassy area in the middle of the parking lot. There’s no curb-cut access to the tables, and the transition is a bit bumpy, but if you can manage it, there’s a great ocean view from the picnic area. You can also connect to the middle section of the MacKerricher Haul Road Trail near the top of the parking lot. Just follow hard-packed dirt path to the left of the trail sign, and turn right (south) when you reach the 12-foot wide paved trail. The 1.29-mile segment is level, and although some patches of asphalt have seen better days, it’s easy to dodge those areas. The first part of the trail is bordered by conifers, but after a half-mile it opens up to an ocean view on the right. It’s a very pleasant stroll, and it’s quite popular with the locals. It’s also a good place to spot whales, especially if you want to ditch the crowds. And even if you don’t see a whale, the ocean view is simply intoxicating.